Grapy, richly fruity, medium-bodied flavors of cocoa, white chocolate, spicy herbs, and black currants jump from the glass of this deliciously evolved, complex wine. It is a soft, easy-going St.-Julien to consume over the next 8-10 years. 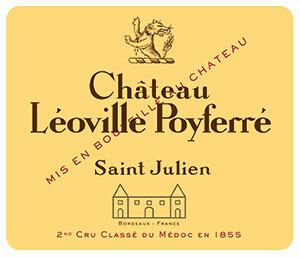 Tasted at BI Wine & Spirits' 10-Years-On tasting, the 2007 Leoville-Poyferre has a tightly wound bouquet at first, although it unfurls to reveal attractive cedar and undergrowth-tinged black fruit, dried blood and cured meat aromas. The palate is medium-bodied with a grainy texture, a fine thread of acidity and a grippy, almost Pauillac-like, graphite finish that lends body and focus. This showing at ten years suggests that, after differing performances in its youth, this Saint Julien has settled into a groove; in fact, I envisage it maturing with style over the next 15-20 years. Tasted February 2017.